One of the more important things to remember is that there are certain “trap” words that can ruin your message by having it directed to the junk folder. There are around a couple hundred words that can cause problems when trying to achieve good delivery rates. We're not saying NEVER use these words, however, they should be used very sparingly. 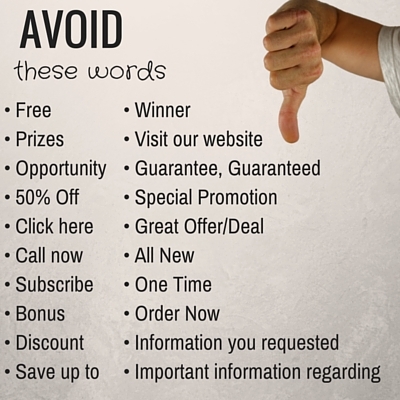 If you're having a problem staying out of the spam or junk folder, these words could be putting you there. When you finally get to the body of your message, don't forget to add some personality. Make the body of your message a good text to image ratio. Put your "call to action" towards the top of your message. So, the what, the why, and the how….Make sure your recipients know what they are receiving, why they have received it, and how they can benefit from it.